CANTON, Mass. (October 22, 2013) – With Halloween approaching, Dunkin’ Donuts, America’s all-day, everyday stop for coffee and baked goods, is lifting spirits in fun ways to celebrate the holiday. For a frightfully delicious treat to keep guests and ghosts alike running this week, Dunkin’ Donuts’ bewitching bevy includes the return of the Boston Scream Donut, Dunkin’ Donuts’ spooktacular seasonal variation of its classic Boston Kreme donut, tricked out for the holiday with an orange icing drizzle. 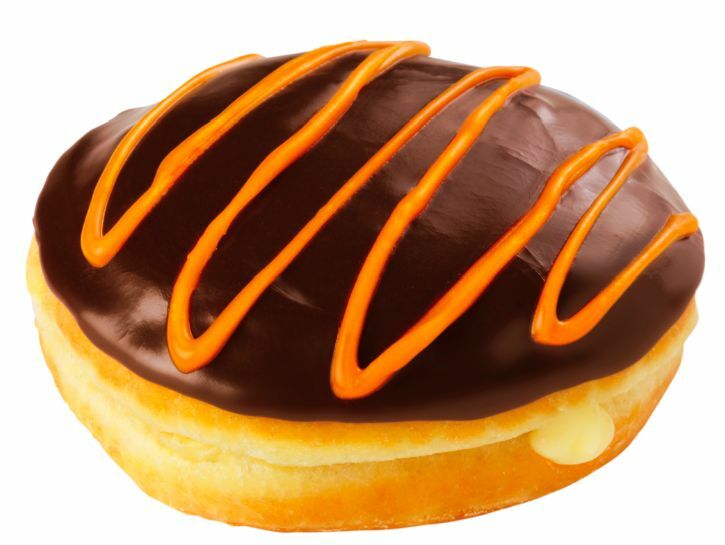 The Boston Scream Donut is available through Halloween at participating Dunkin’ Donuts restaurants nationwide. Dunkin’ Donuts is also inviting fans to brew up some Halloween fun by dressing up their cup for a chance to win a $100 Dunkin’ Donuts mGift as part of the second annual #dresseDD Twitter and Instagram Contest. Today through October 28, fans are encouraged to tweet @DunkinDonuts on Twitter or Instagram photos of their Dunkin’ Donuts cups cloaked in a creative Halloween costume, using the special hashtag #dresseDD. On Halloween day, October 31, Dunkin’ Donuts will share the photos of five winners selected for their creativity and Halloween spirit, and each will win a $100 mGift to help keep running with Dunkin’ Donuts coffee, donuts, sandwiches and baked goods long after the holiday. No purchase necessary, 18+ to enter. Void where prohibited. For additional terms and conditions related to Dunkin’ Donuts’ #dresseDD Contest, visit: http://dun.kn/dresseDD. For Halloween, MUNCHKINS® are also dressing up. Dunkin’ Donuts’ MUNCHKINS donut hole treats now come packed in a limited-edition, Halloween-themed box, featuring the classic treats displaying festive holiday costumes. Perfect for Halloween parties at any favorite haunted house or ghoulish gathering, Dunkin’ Donuts MUNCHKINS are available in 25 and 50 count boxes at participating Dunkin’ Donuts restaurants nationwide through the end of the month. Dunkin’ Donuts has also scared up two special offers, as this month guests can receive $1 off the regular price of a dozen donuts, and $1 off the regular price of any size Coolatta® frozen beverage. Both offers are available only through the “My Offers” tab of the Dunkin’ App, the brand’s app for mobile payment and gifting, enabling guests to pay for food, beverages and merchandise at participating U.S. Dunkin’ Donuts restaurants by scanning their Dunkin' Donuts Cards stored in the app either in-store or at the drive-thru. Guests can also enjoy mobile offers via the My Offers tab, where they can receive exclusive, geo-targeted regional discounts and promotional offers for Dunkin’ Donuts’ famous coffee and other favorite menu items. The Dunkin’ App is available for free from the App Store on iPhone or iPod touch or at www.itunes.com/appstore and from the Google Play Store at https://play.google.com/store. Guests can also use their Dunkin’ App to show their Halloween spirit, by purchasing a mobile Dunkin’ Donuts Card in several fun new seasonal designs, such as cartoon images of jack-o-lanterns lit by Dunkin’ Donuts coffee, zombies rising from the ground with coffee in hand, and vampires encouraging all to “stay calm and drink coffee.” With the App’s mGift feature, Dunkin’ Donuts allows people to send virtual gift cards by text, email and Facebook Connect. Finally, guests can continue to enjoy Dunkin’ Donuts’ full autumn array of pumpkin food and beverages, including pumpkin coffees, lattes, donuts, muffins and more. This season Dunkin’ Donuts has also introduced a new Pumpkin Pie Donut and new Frozen Pumpkin Coffee Coolatta®. The full menu of fall favorites is available at participating Dunkin’ Donuts restaurants for a limited time.